Place new (clean and unused) 6-cup capacity fishbowl on cookie sheet. Place gelatin in large bowl. Add hot water; stir until completely dissolved. Add cold water; stir until well combined. Pour gelatin mixture into fishbowl. Refrigerate until set, about 2 to 4 hours. Insert butter knife into set gelatin about 1 1/2 inches from edge of bowl; make slit large enough for 1 gummy eyeball to pass through. Press gummy eyeball to bottom of bowl with finger or butter knife. Repeat process around edge of bowl with remaining gummy eyeballs. Top gelatin with whipped topping. Refrigerate until serving time. If you don’t have a fishbowl for this project, use 8 clear plastic cups and divide the gelatin mixture evenly among them. When set, insert an eyeball into each cup (as per directions) and top with whipped topping. 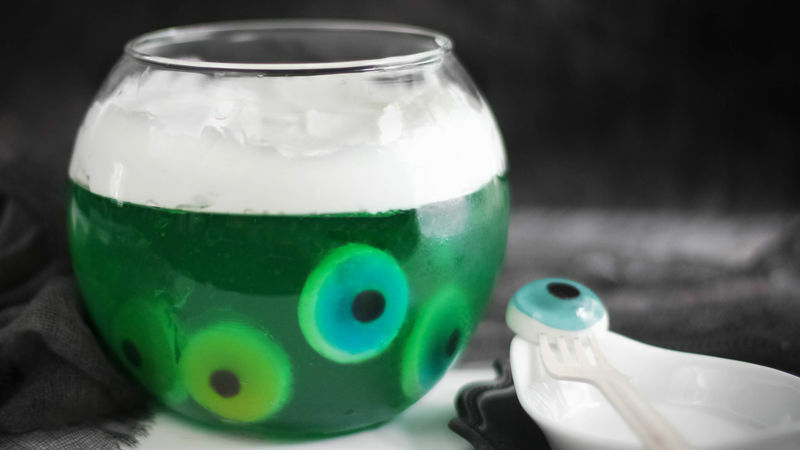 Gummy eyeballs are less visible if inserted towards the middle of the fishbowl, so be sure to keep them near the outer edge. Gummy worms could be added on top for an even creepier presentation!